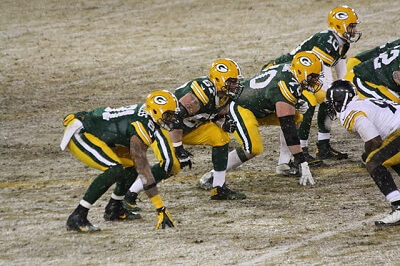 Get notified when Green Bay Packers tickets are available! Beloved by their fans, the Green Bay Packers are the pride of Wisconsin and have been since the team was founded in 1919. Today, the team is in the North Division of the NFC of the NFL. Even though temperatures on game day are often frigid, fans loyally turn out to Lambeau Field in Green Bay to watch the Packers play. Nicknamed The Frozen Tundra, the stadium has been the home of the Green Bay Packers since 1957 and holds more than 81,000 fans for events. You can buy Green Bay Packers tickets to an upcoming Green Bay Packers by using the links above.